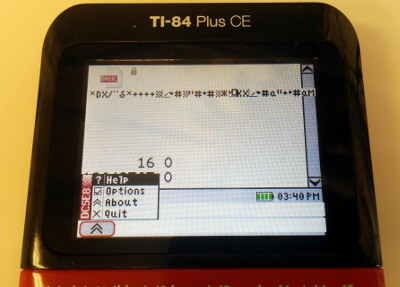 Take the source, make it assemble by finding equivalents for all system calls and memory areas from the TI-84 Plus C Silver Edition on the TI-84 Plus CE. Debug the shell, module, by module, modifying components to work properly. One needs to take into account things like 3-byte registers, the new memory format, and the fact that Doors CE is now going to be a program rather than a shell. Great work Kerm! What stage in the porting process are you at now? I have just started stage 2, and I expect it to be fairly time-consuming. 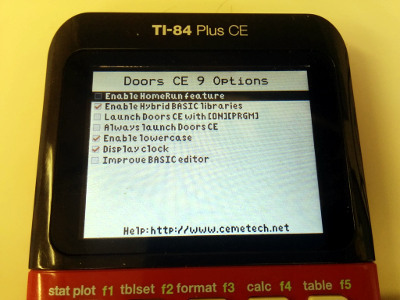 The fact that we don't yet have a community TI-84 Plus CE emulator, including debugging tools, is a significant barrier to moving fast with this. So, the earlier request I made in the Cesium thread applies here too. I would totally love to implement this, but I am not entirely sure what you are getting at. Could you please detail it a little more? Thanks! This allows for reasonable terminal interfaces, file opening mechanisms, and all sorts of goodies, for the same reasons it's a standard everywhere else. or equivalent; or in some other implementation-defined manner. The value of argc shall be nonnegative. argv[argc] shall be a null pointer. If the value of argc is greater than zero, the array members argv through argv[argc-1] inclusive shall contain pointers to strings, which are given implementation-defined values by the host environment prior to program startup. The intent is to supply to the program information determined prior to program startup from elsewhere in the hosted environment. If the host environment is not capable of supplying strings with letters in both uppercase and lowercase, the implementation shall ensure that the strings are received in lowercase. If the value of argc is greater than zero, the string pointed to by argv represents the program name; argv shall be the null character if the program name is not available from the host environment. If the value of argc is greater than one, the strings pointed to by argv through argv[argc-1] represent the program parameters. The parameters argc and argv and the strings pointed to by the argv array shall be modifiable by the program, and retain their last-stored values between program startup and program termination. Yes, I definitely plan to do this (and I'll also be continuing to use the field-based shell program header from Doors CSE). Do you have any particular proposals for passing argc and argv to ASM programs and getting them back from ASM programs? I guess for C programs, the API will be a little more obvious. C programs and ASM programs should have the same format. ASM programs can handle the stack manipulations manually in the cases where they care, and ignore them in the cases where they don't. I say celtic 3 this time Cause why not Sure it's longer to port but the way I see it, every extra ASM command that is ported will be an extra tool available for CE programmers which are sure to be plentiful These ASM libs basically allow some asm functionality to basic programmers, who don't really want to learn ez80 but still want to "make cool things" which is of course, super precious. Ps: WOOOOT!!! 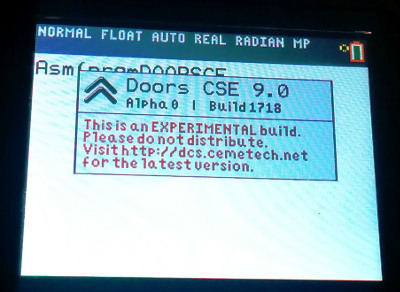 Doors CSE 9.0!!! Celtic 2 will be installed to help keep backwards compatibility of programs/games made on the CSE. This looks great so far Kerm, let me know when there's a testing version to try! Guess I better finish xLIBCE . That would be hugely helpful. Did we decided that 8bpp mode + using the two halves of the GRAM as the two buffers would be the right solution, albeit difficult to use to emulate the abuse of xLIBC in full-resolution mode from the TI-84+CSE? Okay, that's fair. Do we actually have a specific calling convention for C programs that we're using, or are we following whatever Zilog's compiler does? Mateo? Let's look at this another way: what Celtic III functions that aren't in Celtic 2 that you think are important? xLIBC and parts of Celtic 2 CSE cover all kinds of graphics functions, plus everything that most people need to manipulate programs and AppVars. If there are specific functions that you think are important, I'd be more than happy to explore including them. That's not the job of the compiler, that's the job of the startup routines, which also initialize the BSS and setup the vectors. These are written in assembly; here is the relevant standard C startup portion, of which I have modified to support other things, and the relocation of errno. (I'm still working on the details, so the code below is the standard implementation). Implementing an input of the standard arguments of main() is up to you. The calling convention for C functions is pushing all arguments onto the stack in order of argument number, regardless of type. All items int and lower are passed as 24 bits, even though they aren't. Return values are documented in the ZDS docs. ;* Copyright (c) 2007-2008 Zilog, Inc.
;* Startup code. Reset entry point. In addition, it is probably better if the shell initializes the BSS section in order to limit repeated code. C programs that run without a shell technically shouldn't be allowed. in my opinion, mainly because of the requirements. There basically needs to be an overlaying layer. I haven't officially decided on a location for the BSS section, because it needs to be set statically by programs. I imagine it will be at least 20kb though. I've also tried looking into the #nobss pragma, but it doesn't appear to function as desired. Thanks, Mateo. I'll wait until you figure out a good solution for the BSS for intercompatibility between your shell and Doors CE to add code to initialize the BSS myself (plus, I have much to do before I get to making C program execution work anyway). I've been getting various components to work; here are some "screenshots" for your collective edification. Note that the weird display of the clock/battery icon/taskbar in the first screenshot are due to debug prints, not a graphical error. The weird display of the program name is a bug, however. Very nice work Kerm! As for names not displaying correctly, are you sure that you are looking at the name length byte when you display? You shouldn't be getting that many characters. As for names not displaying correctly, are you sure that you are looking at the name length byte when you display? You shouldn't be getting that many characters. Haha, thanks for the suggestion. Tracing showed that the stack level is getting disturbed: somewhere there's one too many pops. 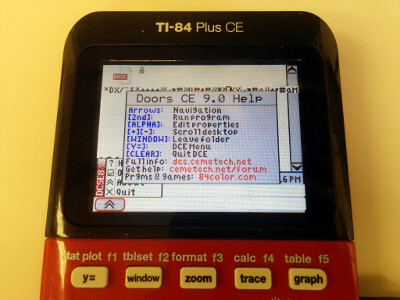 This would be a bit easier with an TI-84+CE jsTIfied. The former two seem extremely useful, and I'll add them. Please remind me to do so. I think UngroupFile never really worked properly, from Iambian's notes, and I think MatToStr is too narrow (and can be done with a combination of NumToString and simple TI-BASIC code) to include. Repaired 16->24 bit issues with PrevVATArray, the VFAT, routines like ldhlind, and so on. Looks like most (?) of the easier GUI part, and some of the VAT part, are done. Have you given a close look to Mateo's work on the library and loader ? This may be slightly off-topic (but hey, you brought the topic first yourself): what are you so afraid of ? I don't know how ExecHex is currently structured, but it seems it would be extremely useful to have an argument that specifies the address from which to copy + execute it. There are 204 users online: 4 members and 200 guests. © Copyright 2000-2019 Cemetech & Christopher Mitchell :: Page Execution Time: 0.162900 seconds.